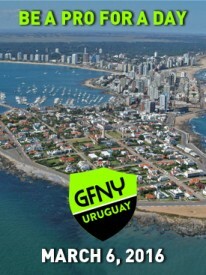 NEW YORK CITY, December 4, 2015 – The inaugural GFNY Uruguay is set to take place in the “Saint Tropez of South America”, Punta del Este on March 6, 2016. With its many beaches, elegant seaside homes, yacht harbor, high-rise apartment buildings, exclusive hotels and glitzy restaurants, “Punta” is South America’s most glamorous resort. GFNY Uruguay is offering two distance options: a long route of 112-mi / 182km and 6,575ft / 2004m of climbing and a medium route of 54-mi / 87km and 2,637ft / 804m of climbing. While just a few are in the hunt for the overall win, there will be many aiming to finish among the top 10% of finishers in their category to qualify for a racer corral spot at the GFNY Championship in NYC on May 15, 2016. All GFNY World events are true cycling marathons that offer cyclists start-to-finish timing, police-moderated course control, ranking based on finish time, age group awards, a consistent set of rules and a great tourism and family experience. GFNY is dedicated to providing cyclists a memorable and challenging cycling experience in unique locations and growing the global footprint of GFNY with more events. Registration for the race is available at gfnyuruguay.com. The 6th annual Campagnolo Gran Fondo New York on May 15, 2016 will also be the second annual GFNY Championship. The race features the world’s most international peloton with riders from over 70 countries. Athletes take on a challenging 100-mile route from NYC to Bear Mountain and back to compete against each other, the clock and themselves in a personal endurance challenge. The 50-mile GFNY BEAR on the same day is a non-competitive ride from NYC to Bear Mountain. GFNY WORLD now features events in Mexico City, Italy, Germany, Cozumel, Argentina, Colombia, Uruguay, Indonesia and at Mont Ventoux/France. Riders there have a chance to qualify for the elite racer corral at the GFNY Championship in NYC by placing in the top 10% of their age group. The official Gran Fondo New York website is: gfny.com.